A new challenge is being shared today on the Impression Obsession Blog, and I hope you join the fun! This week’s challenge is Happy Haunting. Pull out your Impression Obsession stamps and/or dies, and join us! I had a blast making my project for this week’s challenge! To create my happy haunting card, I die cut Three Trees Background from black cardstock and set it over a piece of fun “dropping spiders” printed paper. I die cut Mini Ghosts and two of the Monsters from white cardstock and colored them with markers to give them lots of character. The monsters are adhered to the card with foam adhesive so they pop up from the card. I added googlie-eyes for extra “happy”. I die cut the witch from the Halloween Set from black cardstock and black craft foam, adhered the cuts together and added her and the mini ghosts to the card among the trees. Finally, I die cut the Trick or Treat sentiment several times, adhered them together to give the sentiment dimension, and adhered it to the card. The entire tree panel is adhered to a orange and white polka dot printed paper, which is adhered to a white card base. Whoooo-woooo-wee, I’m just delighted with this happy haunting project! Find all the details on this week’s challenge on the Impression Obsession Blog. Join us, won’t you? Picket Fence Studios is releasing several new stamp sets and I’m delighted to share a project today that features one of the new sets, A Gnome Winter (S126). This fella is so cute in his knit hat! 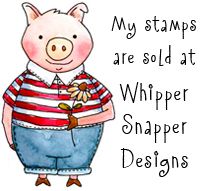 I used one of the sentiments in the set to lightly stamp the background, to create a slight text background. He is stamped in black ink on kraft colored card stock and colored with alcohol markers. I pulled out one of my long-time favorite stamps and Halloween cling mount sets tonight and made this creepy little friend card. Chicken Witch and cling mount set The Witch is In are both available from Whipper Snapper Designs. I used a web die from Impression Obsession to create a fun web design out of silver glitter paper, and used patterned paper from American Crafts. I had a ball making this cutie! A new challenge is being shared today on the Impression Obsession Blog, and I hope you join the fun! 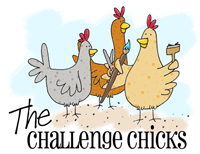 This week’s challenge is Make it Sparkle. Pull out your Impression Obsession stamps and/or dies, and join us! To create my over-the-top sparkly card, I die cut Deer Frame from brown and white glitter cardstock. I removed the negative pieces of the die from the white paper and placed them into place in the brown die cut design creating a two color image. I added a bow and red button on top of several glittery die cut pine pieces I made with the Pine Sprig Cluster and Patchwork Holly. And woooo-wee does he sparkle! Find all the details on this week’s challenge on the Impression Obsession Blog. Impression Obsession: Gift Certificate Winner! Thank you everyone, for the wonderful comments you left on last week’s Impression Obsession Fall/Winter die release project posts. 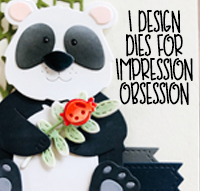 I randomly selected one comment from comments left and am happy to announce Andrea H. as the winner of a $10 gift certificate to the Impression Obsession online store. Congrats, Andrea! I will email you directly with your certificate details.